Commonly described as Chronic Ulcerative Paradental Stomatitis (CUPS), is a very painful condition due to ulcerations in your pet’s mouth. These patients experience oral pain, maybe reluctant to open his/her mouth, have bad breath, can be hesitant to eat or may drool. Maltese, King Charles Spaniel, Terrier, German Shepherd, and Greyhound are commonly affected breeds. 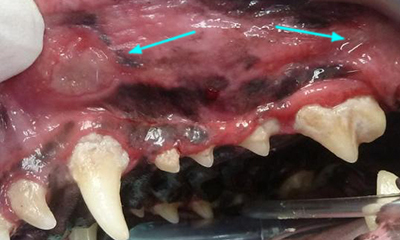 Cheek or kissing lesions above the canine and premolar teeth. Classic “kissing lesion” (ulcer) above the premolar and molar. Your pet should receive professional teeth cleaning and polishing with a strict regime of daily oral hygiene/tooth brushing at home. If that is not successful, tooth extractions are necessary. Schedule an appointment today to have your pet evaluated for canine stomatitis. 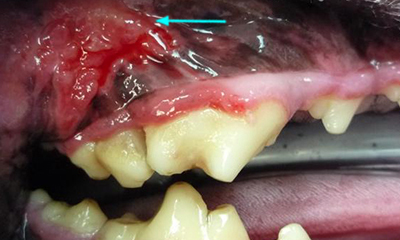 Canine stomatitis is commonly described as Chronic Ulcerative Paradental Stomatitis (CUPS). Patients with CUPS will present with oral pain, reluctance to open their mouth, bad breath, drooling and loss of appetite. Many pets will have had previous teeth cleanings that, “no longer seem to help”. These patients may have mild to advanced calculus, mild to advanced gingivitis and the classic “kissing lesions” or ulcerations on the mucosa (checks) that touch the tooth surfaces. These patients have become plaque intolerant and developed severe ulcers on the inside of their cheeks and some have lesions on the tongue. Maltese, King Charles Spaniel, Terrier, German Shepherd, and Greyhound are commonly affected breeds. Medical Plan: These pets receive professional teeth cleaning and polishing, dental X-rays and extraction of any diseased teeth. In order to allow the tissues to heal and prevent futures ulcerations, the teeth will be treated with a barrier sealant called OraVet. One week later pet-owners must begin to provide daily oral hygiene/tooth brushing (note: many pet-owners have difficulty performing this daily task). This plaque control is combined with daily low dose Doxycycline therapy to dampen this immune response. Patients need to be re-examined regularly to assess response to therapy. Surgical Plan: When medical therapy (daily brushing and Doxycycline) is not successful, or the ulcerations are long-standing or advanced, tooth extractions are necessary. In some cases, extracting the caudal teeth (premolars and molars) will be sufficient, while others require full mouth extractions. Full mouth extractions cases may be separated into two procedures with an emphasis on pain control and optimal healing. Over 90% of these patients will achieve clinical remission, which is the resolution of the ulcers, return to comfort and eating.